New to Chiron or looking for something about Chiron in a nutshell? This updated, introductory article has been an enduring favorite. Because Chiron is such an amazing archetype of positive male energy, this post is for Father’s Day—dedicated to all our dad readers and to fostering the positive male energy in us all. Don’t let its small size and unusual nature as part-comet, part-planetoid fool you. Chiron is the missing key to interpreting your astrology chart. It opens the door to personal and planetary evolution. Because mythological Chiron was a mentor of heroes and the first astrologer, the discovery of astrological Chiron in 1977 heralded a whole new way of using astrology and other lost esoteric arts—to bring out the best in each individual. By fostering their greatest talents, each person can go onto contribute them to the collective. This makes a culture hum and a society great. Chiron’s own work was turning out heroes. Nearly every era of history needed heroes, who could argue that current times call for heroism? Chiron is an ambassador between Old (Saturn) and New (Uranus). As it orbits between these two planets, Chiron is connected with process and evolution. Imagine, as Barbara Hand Clow has called Chiron in her book title, a rainbow bridge. Saturn is on one end, Uranus on the other. In the past, the only way hard, institutionalized ways (Saturn) were changed in our world was by revolution (Uranus). Chiron brings us an alternative—step-by-step organic change, the slow but sure type that really sticks. We need it, because human beings don’t handle change easily, much less drastic and unexpected change. Once change is achieved—we cross the bridge from Saturn to Uranus—and we sit with it awhile, the New eventually becomes Old, and we start the process all over again. It is really an endless recycling loop, apropos because the centaur Chiron was keeper of the forest and is strongly associated with ecology. The individual with Chiron prominent  has a foot in both worlds—the establishment and the leading edge. S/he is able to work within the system to convey new ideas and catalyze change. Chiron is complex and exciting. It is the archetype connected with your individual journey to wholeness. All key words for Chiron relate to wholeness or achieving it. Prior to Chiron’s discovery, Dane Rudhyar predicted that there would be a planet discovered between Saturn and Uranus that would act as a “higher Moon.” Rudhyar had a glimmer of the reason why Chiron in his mythological story had an incurable wound. It is being stuck in our wounding from the past that keeps us from achieving what we crave in the present. There is no healing without healing the emotional body, and Chiron’s story emphasizes this point. Chiron was wounded in a fracas with the wild centaurs that interrupted a wedding. The wedding is a metaphor for the inner marriage of feeling complete, where the all parts of us are wed in harmony. Our ability to become all that we can be is interrupted constantly by our own devils, the wild centaurs within us--the one’s Chiron was not like and stood apart from. Those dark forces cause the scars of unresolved pain. Chiron was a great herbalist and surgeon, the teacher of Asclepius, Father of Medicine, yet he could not heal himself. This is what happens if we don’t confront our inner demons. The myth, astronomy, and events surrounding its discovery contribute rich metaphors to understanding Chiron as an astrological influence. The cultural phenomena most connected with Chiron’s discovery are the “New Age” and holistic healing. I put New Age in quotes because there is nothing new about it, just a resurfacing of repressed esoteric knowledge that has been present, if underground at times, for millennia. In addition, I want to distinguish the sincere and beneficial practice of these arts from the pejorative way this term is sometimes used by those who don’t appreciate them. Both Chiron’s myth and astronomy tell us of the need to merge the opposites within us to achieve wholeness. Our cultural wound is the split between instincts and intellect (represented by mythical Chiron’s centaur body, half man and half horse). The astronomer who named Chiron had great intuition, whether or not he realized it at the time. Only later was it confirmed that Chiron is a composite as a planet, too. The American Astronomical Union has classified objects like Chiron “centaurs” —the thousands of others like Chiron discovered beyond Neptune. The term is in Chiron’s honor, the first centaur planet discovered. Chiron’s energy has been rediscovered at a time when we need it most, and his story has a number parallels to the later life of Jesus. Since one function/meaning of the “rainbow bridge” is to bring heaven to earth, we can see Chiron as a nonreligious, but spiritual archetype that gives us a prescription for wholeness and achieving it. Chiron is about healing where we feel misfit and unrelated and finding our place in the world—interconnected and in communion with each other. In a birth chart, astrological Chiron is the point of chart synthesis, where old pain can be transmuted and the individual can become a model for mastery of a specific life lesson. By working through and finding the gift in our own suffering, everyone whose life we touch benefits by example. This is true heroism and why Chiron mentored heroes. This is why we crave “human interest” stories. Pain is our teacher, because it holds the key to our healing. Each of us has a job to heal our own wounds so that we can learn from each other. So often, where we were hurt the most contains the seed of our gift to give in terms of life’s purpose and “real work.” Examples: A kid who grew up in the ghetto, makes it rich, and becomes a philanthropist; or the domestic violence victim who runs a shelter to protect others who are still in the process of breaking free. If you don't know your Chiron, you don’t know what you’re missing! 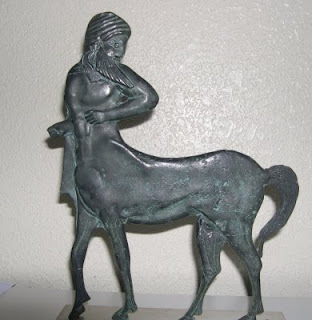 Photo: Statue of a centaur I purchased in Athens during the Chironic Convergence in 1996. The Chironic Convergence was a journey to the Pelion region of Greece--Chiron's mythical homeland-- for astrologers and astrology students to explore Chiron. For more articles on Chiron on The Radical Virgo, enter Chiron in the Search This Blog feature near the top of the sidebar. Clow, Barbara Hand, Chiron: Rainbow Bridge Between the Inner and Outer Planets (Llewellyn: 1987). Chiron is prominent when placed on one of the four angles or cusps of the 1st, 4th, 7th, and 10th houses (Ascendant, IC, Descendant, or Midheaven). It is considered especially prominent if placed in the 1st House of identity or self-expression (Barack Obama has this position) or the 10th House of career/public life (Angelina Jolie, Elton John). Numerous aspects to Chiron also contribute to prominence, most notably conjunctions, squares, and oppositions. Just one of these can make a person “Chironic” if they are to the Sun, Moon, or Ascendant. Thanks to astrologer Dale O'Brien for enhancing my awareness of the connection between the Chironic wound and career paths. This article first appeared in Welcome to Planet Earth. Hot Flashbacks, Cool Insights: Happy Rebirthday!